From Wueste Film, the producers of Fatih Akin’s feature Head-On (winner of the 2004 Golden Bear in Berlin as well as the German & European Film Awards), comes another drama by a Turkish-German director, Buket Alakus. 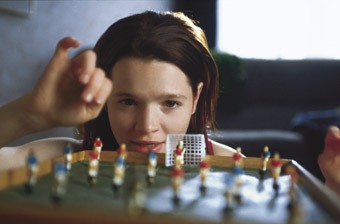 Her first feature Anam (2000) won the Prix Europa and numerous other awards. In Offside she proves a sure hand in treating a sensitive subject matter with liberating lightness. Buket Alakus was born in 1971 in Istanbul and grew up in Hamburg. After finishing her studies at the Academy of Fine Arts in Berlin in 1995, she studied Film Directing at Hamburg University\'s Institute of Theater, Music and Film from 1996-1998. Her films include: the shorts Martin (1995), Schluessel (1996), Tango (1997), Kismet (1998), her award-winning feature debut Anam (2000), Offside (Eine andere Liga, 2004), Freundinnen fuers Leben (TV, 2005), the children\'s series Kinder.de (2006), and Finnish Tango (Finnischer Tango, 2008).